These little pendants are my new addiction! 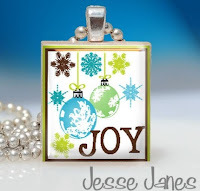 If you haven't seen them, they are cute little graphics on a scrabble tile and covered in a resin for protection. They hang from a simple chain or ribbon. There are many Etsians who offer these; and I have to admit, I personally have about 6 so far. They are inexpensive, fun, and also make great gifts! Etsy Treasury feature: Polka dots! Wordless Wednesday - Happy Holidays!